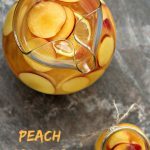 This easy recipe for Peach Sangria is sure to be a hit with your family and friends. Celebrate in style with this tasty mix of peach, orange, lemon and Sauvignon Blanc. This is a sponsored post for Frontera Wines via IZEA. All opinions are my own, as always. Thanks to all the companies, and readers, who help support Cravings of a Lunatic. I’m thrilled to be partnering with Frontera Wines for their Simply Delicious campaign. Gameday is closing in on us and it’s time to get planning your menu! 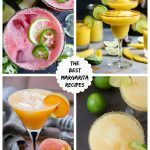 Planning your drinks choices is crucial to a fabulous party! 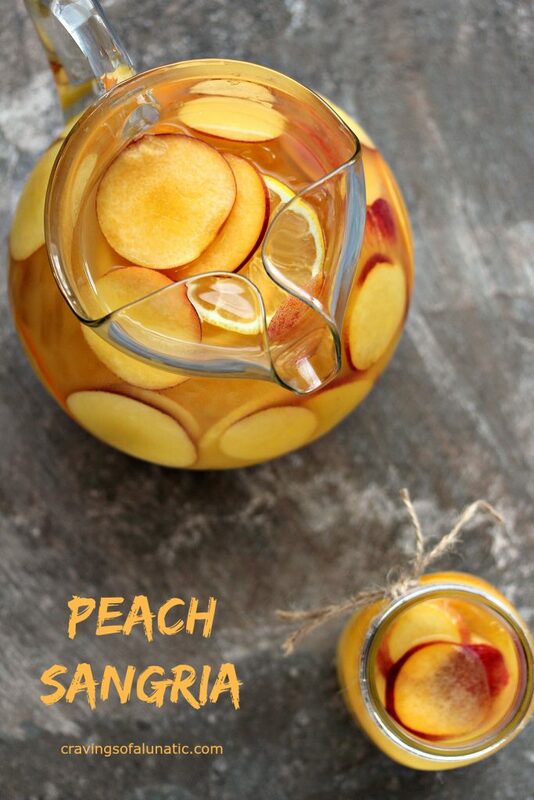 My suggestion is for you to make this Peach Sangria. This recipe is not only a hit with the ladies watching the game, but the guys dig it too. There’s something about Peach Sangria that makes it an equal opportunity cocktail. I’m all for having a two-four on hand for the festivities, but I also think having multiple options is a wise idea. 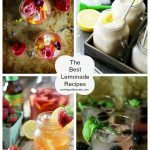 You want all your guests to be happy, so make sure you have lots of variety in your drink choices. What I love about Sangria is how versatile it is. You can mix it up in a variety of ways and play around with it to make it your own. Add a little of this, swap this for that, and you have a whole new cocktail on your hands. It’s such a fun drink to play with. It’s also an all season cocktail if you ask me. If you can find fresh peaches that’s great. In the event that you cannot locate fresh peaches, you can substitute frozen. There are no hard and fast rules here. If you’re not fond of orange juice mixed with Sangria you can swap it out for peach juice. I have another version I’ll share with you at another time where I do that. I’ve also swapped the orange juice out for white grapefruit juice. We love making Sangria for parties. It’s such a versatile drink and I’ve never met a person who doesn’t care for it after they try it. If you really take the time to build the flavour no one can resist Sangria. One tip I’ll give you is to let the flavour really mingle and build. I suggest making the base anywhere from 2 to 24 hours ahead of time. That way the flavour will absolutely pop when you’re sipping it. This one allows the peaches to marinate in the wine for a minimum of 2 hours. Personally, I’d highly suggest making it the night before you need it. That way the peach flavour really shines through. I also used a peach simple syrup for this recipe to amp up the peach flavour. If you don’t have time to make peach simple syrup you can use peach schnapps. Or peach juice. If you have time make the syrup, it’s worth it. Personally, I think the longer you let the fruit soak up that delicious wine the better it will taste. It’s also better really cold. I’m the ice queen when it comes to beverages. The more ice you put in my drink the happier I am. I hope you dig this one. Whether you’re making this for game day or a party, I guarantee your guests are going to love it. It’s always a hit every time I make it. I added a video for you to enjoy. Hope you love it!! Peel the peaches and cut into small pieces. Discard the peel and pit. In a medium saucepan combine the water and sugar and cook over medium-low heat until the sugar dissolves. Add the chopped peaches to the saucepan and bring mixture to a boil, then reduce and simmer for about 20 to 25 minutes. This will allow the peaches to really steep, and the flavour to come through. Take off the heat and allow to cool completely. Then strain the mixture to get rid of the pieces. Strain slowly for a pure simple syrup with no cloudy effects or bits floating about. I use a sieve to do mine. You can also use a napkin over a cup, or even a coffee filter if push comes to shove. Once it's cooled and strained you can make the sangria, or store the simple syrup in the fridge until needed. They last about 1 to 2 weeks and are great to have on hand for multiple uses. Mix the Sauvignon Blanc, orange juice, Cointreau, simple syrup (cooled), and peaches in a large pitcher. Place in fridge overnight. Add the orange slices, lemon slices and ice right before serving. Serve with a big old Peach Loving smile! Make the simple syrup first because it has to have time to cool. I recommend making the Sangria at least 2 hours before you need it. If you have enough time it's actually best if you make it 12 to 24 hours in advance. Just don't add the orange, lemon slices or ice until just before serving. Want it to taste like peach pie? Add a little cinnamon and nutmeg to it. Instant sensory satisfaction. Enjoy! This was so much fun to photograph. The light was all over the place the day I made it so it was fun to play with different settings and setups. Sangria, not only delicious but super pretty! I love that. This is such a fun drink. You can make it in winter for game days, just use frozen peaches. Or if you’re lucky to live somewhere that ships in produce you can use fresh peaches, you’ll just pay a bit more. I used fresh for this recipe. We had some great peaches at the local supermarket so I jumped on the opportunity to use them for a recipe. If you want more peach flavour in this you can swap out the orange juice for peach juice. I made a great peach simple syrup to add to mine so it tasted fabulous. Plus I let my fruit marinate in the alcohol overnight so it really amps up the peach taste in this. Feel free to adjust things to your own taste. Life is about making yourself happy. Don’t hold back. I hope you make this. Whether you make it for game day, or a family gathering, or even a potluck dinner, you’ll be the belle of the ball if you make this. It’s sheer peach perfection and your guests will be asking you to make it every time they visit you. Thanks for reading. Cheers to a successful game day. May your glass be bottomless and your team be victorious! If you’re looking for more game day recipes be sure to peek around my recipe index. You’ll find lots of appetizers and tailgating recipes there. You can also visit my grilling site, Kiss My Smoke, for great game day options. I’m just getting ready to relaunch Kiss My Smoke next week. So excited to finally be grilling again. You can follow my grilling antics on Pinterest. You can also follow me on Pinterest to stay current on all my recipes and cravings. You can follow all my boards or pick the ones that appeal to you. 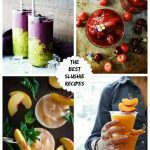 I highly recommend following Yum and Beautiful Food from around the Web. Be sure to follow me on Instagram as well. My feed is full of lots of food photos, daily life and pet photos. For all my fellow pet lovers out there we’re getting a new kitten named Dixon in 2 weeks. You can keep up with his growth on Instagram. I just ordered him a bunch of bow ties to make photo time more interesting. I’m sure he’ll love it. Thanks for stopping by. If you have any recipe suggestions or questions never hesitate to reach out to me. I’m always happy to talk “food” with other food lovers. « The Best Brownies In the WORLD!!! Thanks for visiting Jeff. Hope the sangria is a hit. So happy it cheered you up. I can’t wait for summer. More sangria and sunshine. Pretty photos, delightful drink… I’ll be right over! Thanks, my friend. You’re welcome here any time. In fact, I think we should be room-mates. How fun would that be? mmmm Sangria is so good! Love all of the peaches in this! I bet the peaches and the orange juice are so good together! Thanks so much Angie. This recipe went over so well. The girls were eating the fruit and having a blast. This is perfect for a girls weekend. We should do that. Ha! 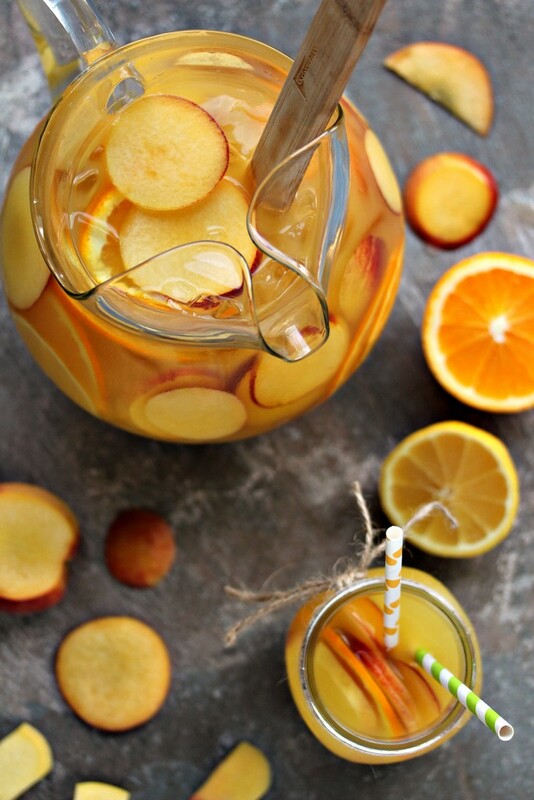 YES to peach sangria, especially in this cold weather! I can sip this and dream of summer 🙂 This looks amazing, I need to try Frontera wine, Sauvignon Blanc is my fave! It is so darn pretty and the lighting looks just perfect! I am thinking how nice it would be to have you make a pitcher and we share a glass or two together some time!! So much fun to have for a Superbowl party!!! Oooh. 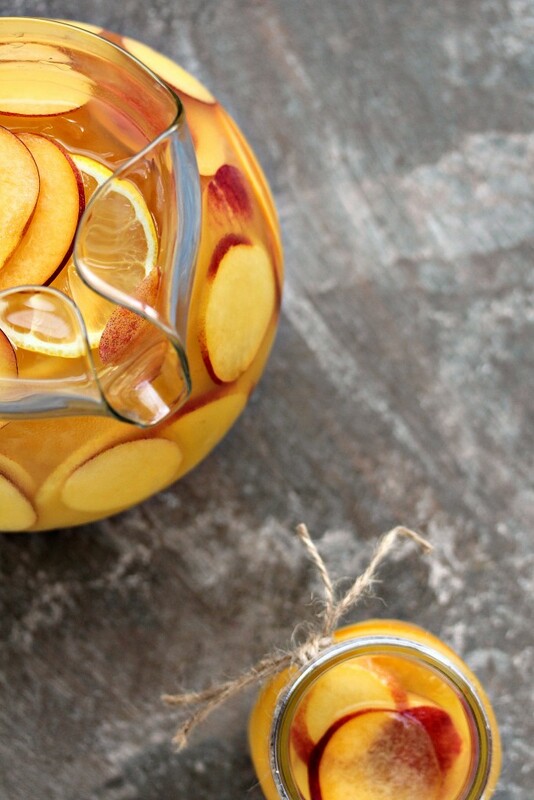 Peach Sangria that’s packed with a punch. I love it!!! Basically this looks like THE perfect Sangria. Peaches and Sauv Blanc are awesome together, so I’m pretty sure this would be dangerous in my hands. 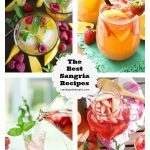 I can see this sangria not only being the life of any party but tailgate, summer sips or just because. This looks absolutely delicious Kim! I am 100% on board with peach sangria. I sorta wish I could put a giant straw in that pitches and drink. it. all. Girl that is one seriously gorgeous sipper of a drink! gorgeous photos!!! Really photogenic sangria 🙂 I’m a big sangria fan, especially white sangria. I would love this!! I love sangria, too! And your peach version has just moved to the top of my favorites! I can’t wait for an excuse to make this (5 o’clock in Indy???). 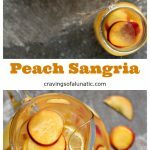 I’m always up for a large pitcher of sangria – this peach one is on point!!! Awe, thanks Naomi. I love a pretty sangria. I can’t wait to make this for my daughter when she comes back from her semester in London, Kim. She’s going to love it! Hope you enjoy it. Also hope she’s enjoying her time there. You must miss the heck out of her. When K was gone for about 4 months last summer I really missed the heck out of her. 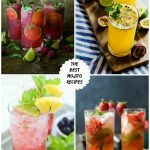 Sangria is definitely an all season cocktail as far as I am concerned! I have to try your peach simple syrup. 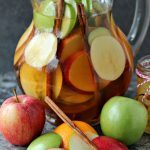 Your sangria looks absolutely divine! Thanks so much. I don’t drink very often but when I do it’s usually something fruity. I love a nice sweet drink. This sounds wonderful!! I would love it if you would link it up to Tipsy Tuesday at Grey is the New Black! Thanks Pam. I’ll try to swing by. Sauvignon Blanc is my favorite wine. I can’t wait to try this gorgeous festive recipe! Thanks Kim! Thanks Lisa. I hope you love it. Love this! Gorgeous photos too! Oh my goodness, I need to make this immediately! Yes! Pour me a glass…or two! 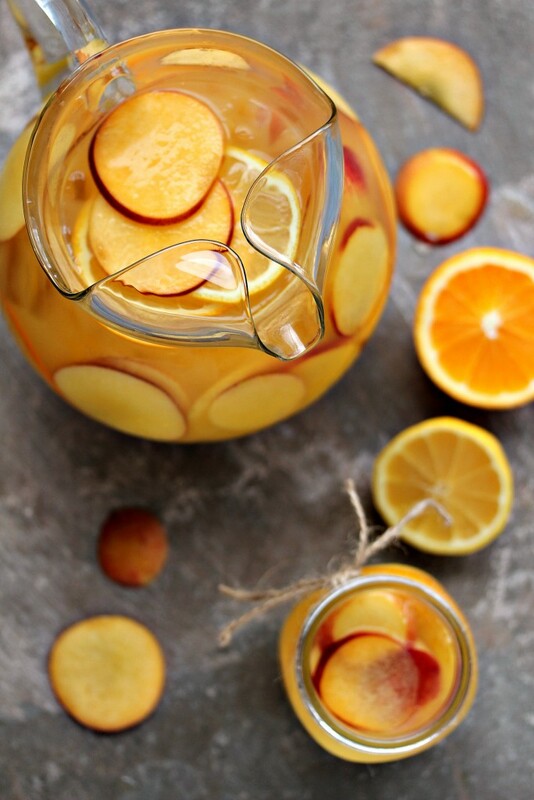 This sangria looks amazing and very refreshing. Thank you for sharing at Merry Monday! Thanks for linking up with Delicious Dishes Recipe Party this week! This sounds delicious!! YUM, YUM!